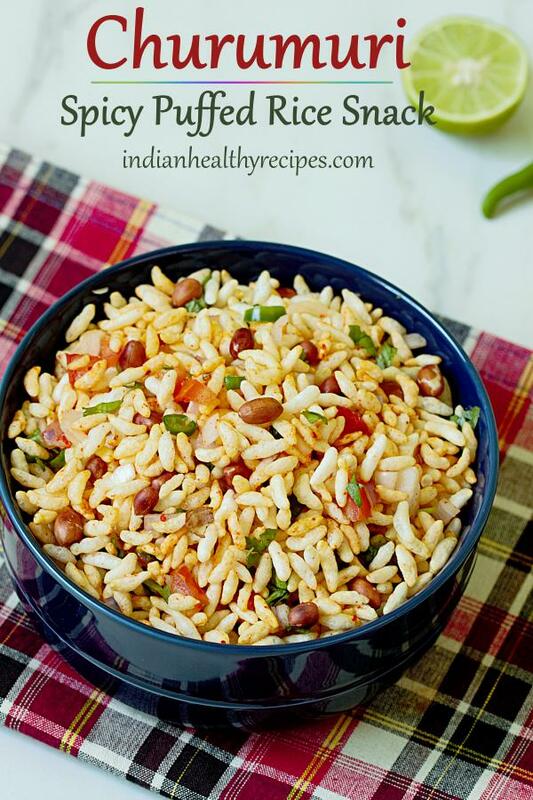 Churumuri recipe – Churumuri or masala mandakki is a popular puffed rice snack in our parts of Karnataka. It is also a street food and is most commonly eaten for as a Evening Snack. 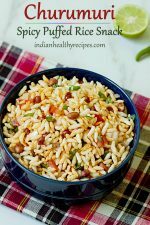 There are many puffed rice snacks made across India with so many different variations. 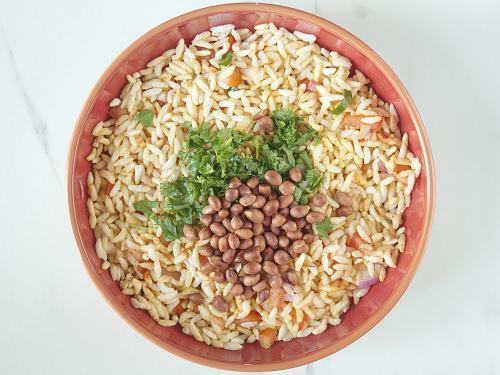 Jhal muri & bhel puri are the 2 most commonly known variations. Churumuri is always a winner for its simplicity as it is made with no fancy ingredients. This can be prepared very quickly by anyone. Even kids can easily make this if they have chopped veggies ready. We Indians across the globe love street foods. A plate full of tangy spicy chaat with a cup of masala tea is the strongest mesmerizer for most of us. But the hygiene that is maintained is very poor in many places so it is always healthy to make these at home. 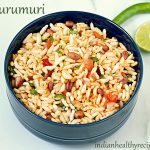 To make churumuri or masala mandakki we don’t need any tamarind chutney or green chutney like the North Indian Bhel Puri. You can easily tweak this basic recipe to suit your taste. You can add some boondi or mixture. Churumuri is usually accompanied with mirchi bajji. 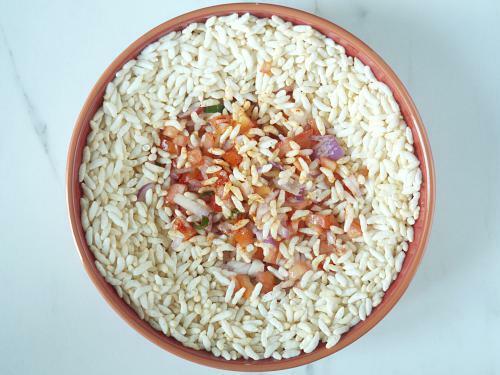 Churumuri is a quick and easy puffed rice snack that is also a popular street food Karnataka. 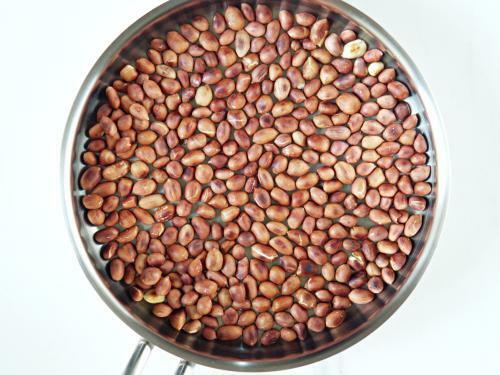 Roast the peanuts well on a medium heat until aromatic. 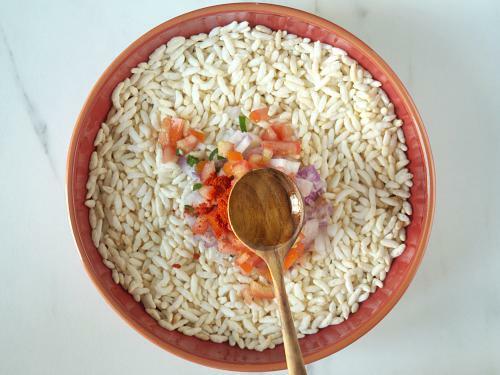 Pour puffed rice in a wide bowl. Clean up the dirt and powdery part. Best way to clean up is to sieve it. 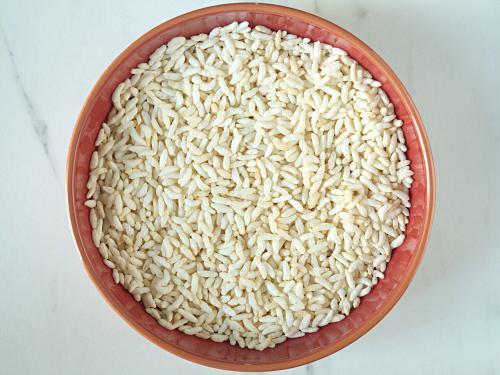 If the puffed rice is not crisp, then roast them in a pan until crisp. Cool them completely. Transfer them to a large mixing bowl. Add onions & tomatoes. Sprinkle salt, red chili powder, lemon juice & oil over the tomatoes. Begin to mix the onions and tomatoes with the spice powder first. Then mix it with the puffed rice. Then add add coriander leaves and peanuts. Toss the churumuri. Serve churumuri immediately else they lose the crunch. You can top it with mixture or boondi. Using very hot ghee instead of oil elevates the flavor of churumuri. 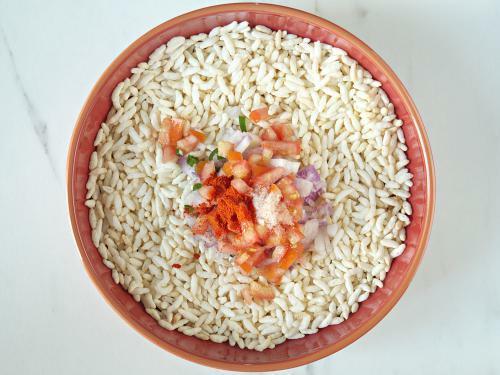 Using a lot of chopped tomatoes can make the puffed rice soft very quickly. I use a very small tomato. 1.First roast peanuts on a medium flame until aromatic and golden. Set aside to cool. 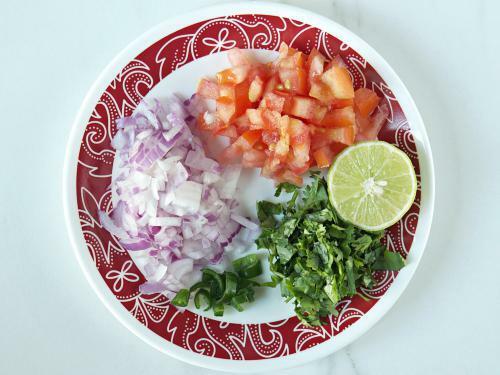 2.Chop onions, tomatoes, green chili and coriander leaves. 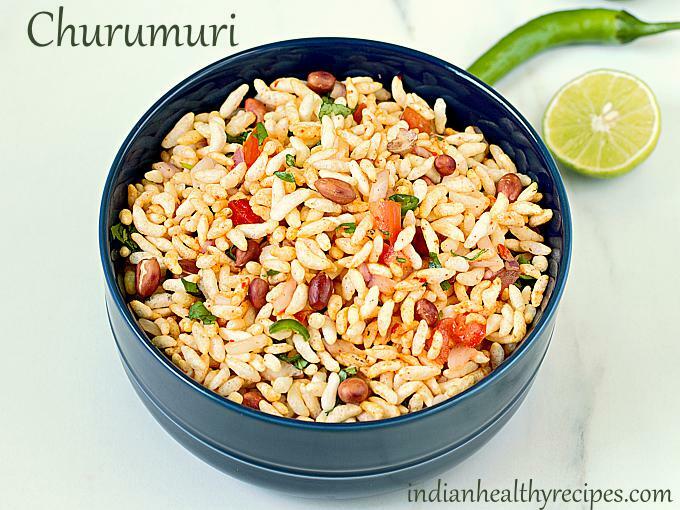 3.To make churumuri, you don’t need to dry roast the puffed rice unless they are soft. I usually break open a new pack to make this so I don’t dry roast. 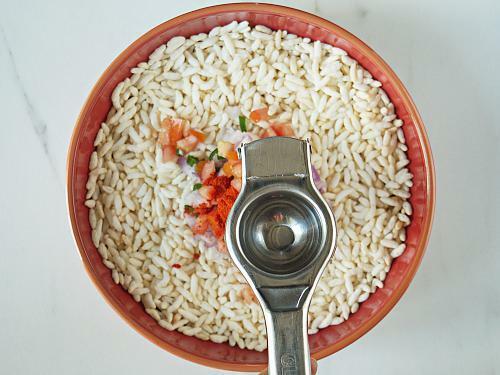 Add the puffed rice to a wide bowl. 4.Add onions and tomatoes to the mixing bowl. Sprinkle salt and chili powder over tomatoes. 5. Squeeze in very little lemon juice as tomatoes too will be tangy. I use about 1 tbsp. 6. Heat 1 tbsp oil or ghee. Pour it. This elevates the flavor of churumuri completely. Optional – We usually add some roasted and coarsely pound jeera then pour hot coconut oil or ghee to bring out the aroma of jeera. 8. Mix the chilli powder and salt well with tomatoes and onions. This helps the chilli powder to spread well. 9. Next mix in the puffed rice with the onion tomatoes. Check salt and sprinkle more if needed. Lastly add coriander leaves and peanuts. Give a gentle stir. Serve churumuri immediately as they begin to loose the crunch. I know it’s quite obvious but salt should be listed as one of the ingredients. Simple and accurate otherwise. Tasty and easy receipe for break fast or snacks..me tried this receipe in this weekend. My fav.. I used to have it in Mysore..
my fav. chat.. love it..